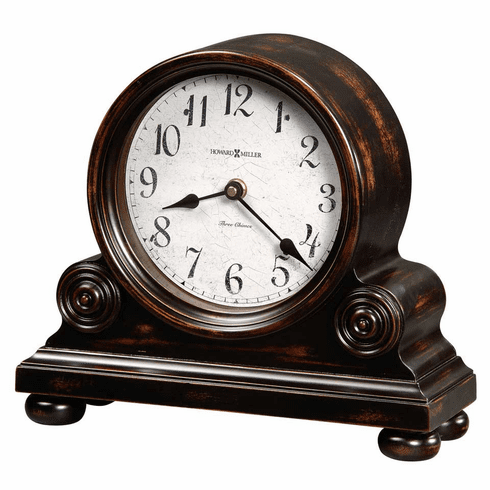 Finished in Worn Black with brown undertones on select hardwoods and veneers, this mantel clock's decorative details include applied rosettes and bunn feet. Aged dial offers black Arabic numerals, black spade hands, and convex glass crystal. Quartz, battery-operated, triple-chime Harmonic movement plays choice of full Westminster or Ave Maria chimes with strike on the hour with 1/4, 1/2, and 3/4 chimes accordingly; Westminster chime and strike on the hour only; or Bim Bam chime on the hour only. Volume control and automatic nighttime chime shut-off option. Requires two C sized batteries (not included). H. 11" W. 12-1/4" D. 4-1/2"